Topics: Culture, Acharavi, Eating Out, Facilities, Accommodation, and Things To Do. The site has about 12 users daily, viewing on average 1.80 pages each. Its 2 nameservers are ns.123-reg.co.uk, and ns2.123-reg.co.uk. 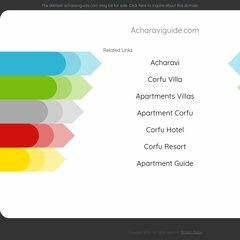 Acharaviguide.com's server IP number is 94.136.55.19. PING www. (94.136.55.19) 56(84) bytes of data.